Turn your photos into magnets to relive pleasant memories, save your kids' artwork, or give as gifts. Magnets also can assist your business with your contact information that the customers will keep for years. We are introducing several new options to make a magnet that’s sure to be present for years in your space. Choose from three different materials – metal, acrylic, and wood. Our magnets can be customised in four shapes – square (2” x 2” or 3” x 3”), round (2.5” x 2.5”), heart (2.5” x 2.5”), and rectangle in a variety of sizes. Checkout our design tool to see all the new options! These photo magnets are sticking about! Making magnets from your photos couldn't be any simpler! 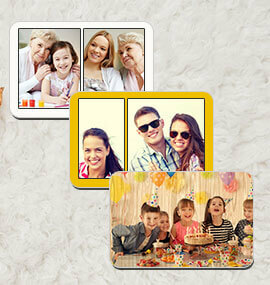 Just use our easy photo magnet tool to upload your desired image. 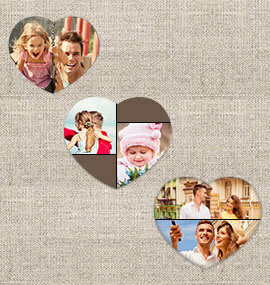 You can even choose our multi-image option to create lovely photo collages centred around your favourite trips, family photos, or pets. Select two, three or four of your favourite photographs, then use the tool to expertly place them on a heart, circle, rectangle or square shape base. Add text or clip art to create engaging and useful organising tools. Or pick a single image and re-create it in the size you'd like. 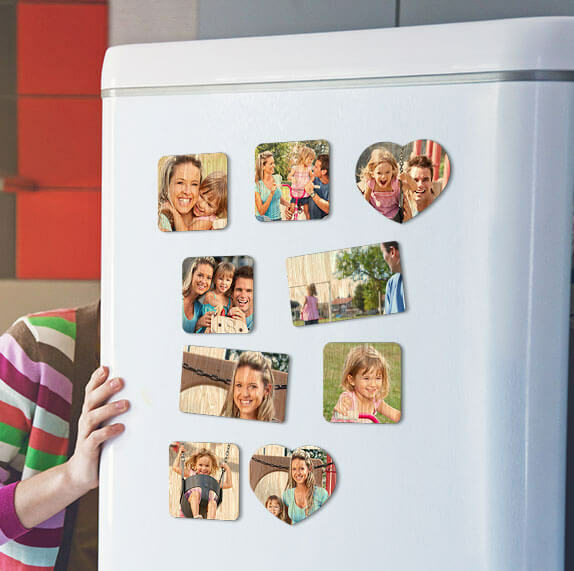 Our personalised photo refrigerator magnets make lovely, long-lasting gifts. After all, who wouldn’t relish a photo that sticks itself to the fridge? Our customised photo magnets won't let you (or the papers behind them) down. A powerful earth magnet is implanted in durable materials. Choose from ¼-inch thick plywood, high-quality clear acrylic, or tin-plated steel. 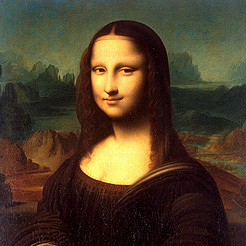 The UV-cured ink is fade-resistant. A unique polyester coating makes them even more capable of standing the test of time. GIVE TINY PIECES OF YOURSELF WITH CUSTOM PHOTO MAGNETS! Creating custom magnets for any occasion or purpose is easy. 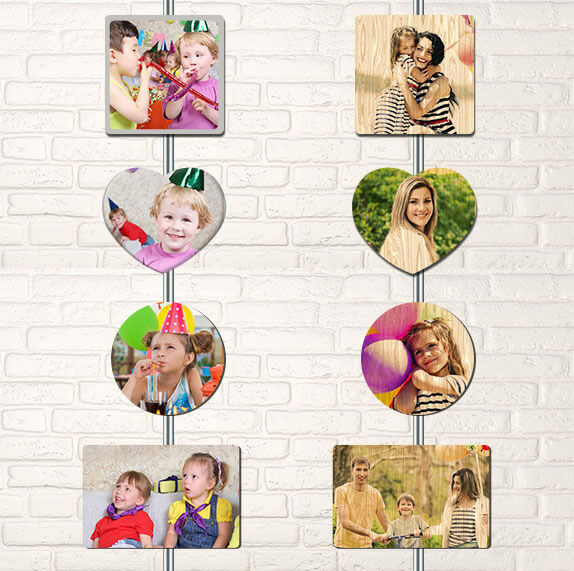 With choices of materials, shapes, and multi-photo templates, there are endless ideas to turn your photos into personalised photo magnets! You won't be able to resist designing just one photo magnet! Transform your photos into magnets and use them as fun, ornamental, or informational pieces. 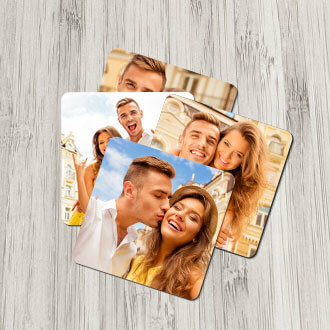 Readily available in metal, wood, or acrylic, our custom photo magnets ooze high quality and style! Think of your fridge as a mini art gallery. Take some of your existing fridge artwork or boring doors of your refrigerator and turn them into custom photo collages. Arrange your photo magnets or utilise them to hang more artwork! 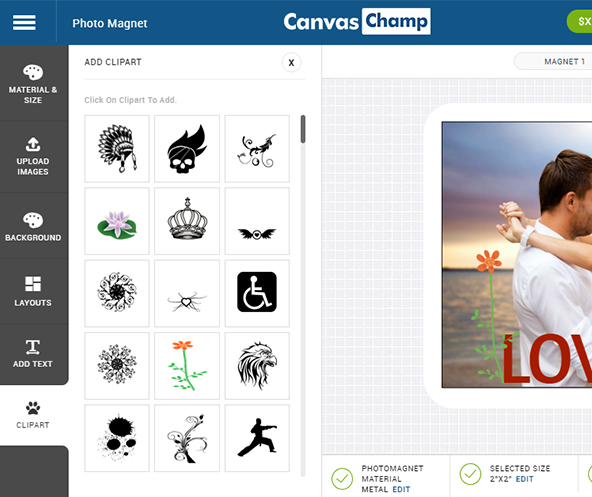 Create magnets from photos to add flair and organise them in any way you choose. Exhibit a message centre, in/outboards, project lists, and more with colourfully personalised photo magnets that use your photos and words. Use custom magnets to notice your message out to the masses. Custom magnets aren't just for photos only. You can upload your business logo, card, or ad promotion for a custom piece that does your advertising for you! Don't keep your talent to yourself. 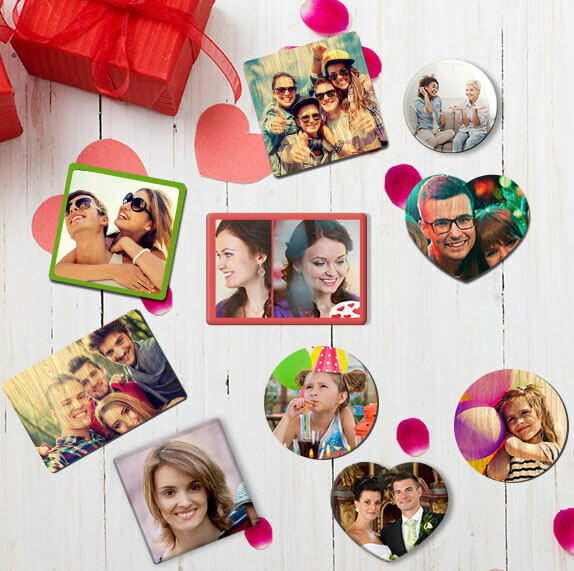 Create magnets from photos of near and dear to loved ones in heart shapes! Photo magnets are a fabulous way to share your choicest pictures with people who have limited wall space. Spark creativity and play by turning several of your photos into magnets and then arranging them into unlimited messages! Or convert a particularly striking travel photo into a photo magnet frame and save the memories fresh long after the unpacking has stopped. 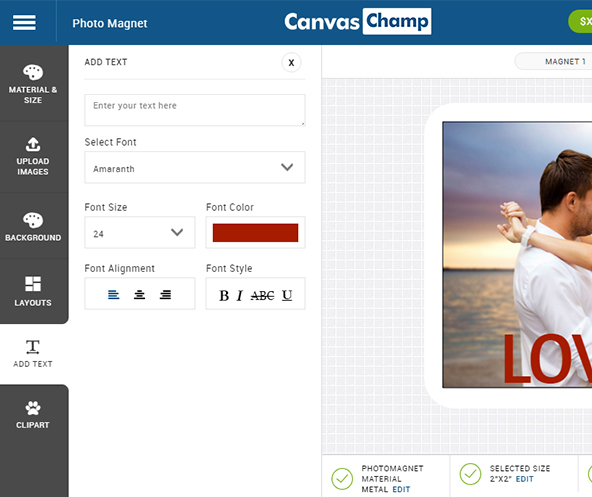 Use our easy photo magnet tool to start giving a piece of you! 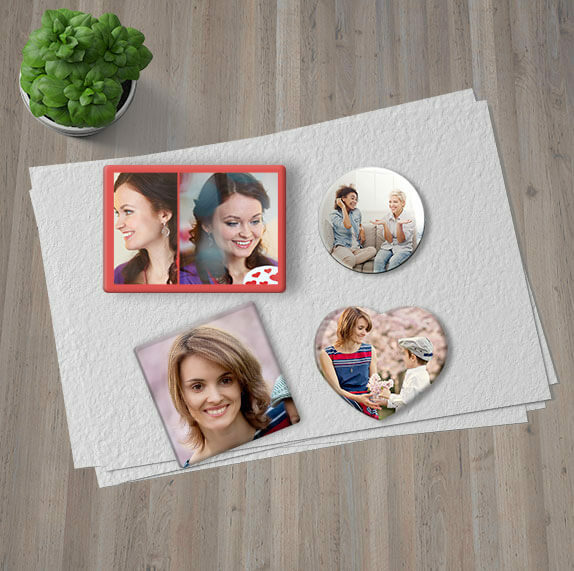 CHOOSE FROM THREE PHOTO MAGNETS MATERIALS AND CREATE YOUR PERSONAL FAVOURITE! Completely assured product! Add a photo or an artwork to your photo magnet. 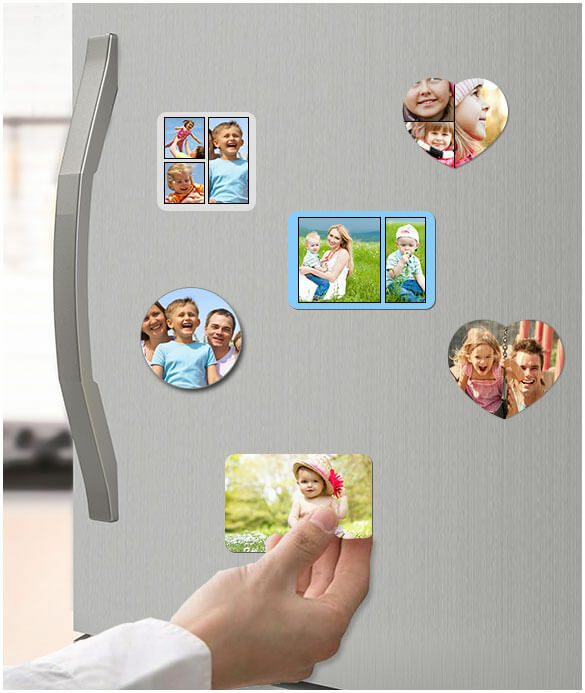 Decorate in a breeze with acrylic photo refrigerator magnets and liven up your home! An on-the-spot gallery right at your fingertips by customised wood photo magnets. Metal photo magnets to last as long as any metal surface it sticks on! 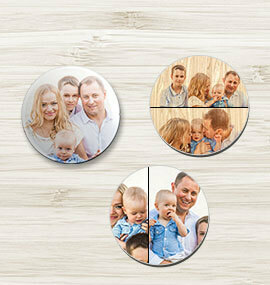 New choices for customised photo magnets enables you to add round, heart, and rectangle to the original square shape. Standard square photo fridge magnets in metal are now available in wood or acrylic. 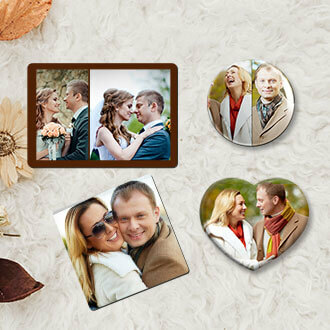 Get a photo of your loved one to treasure on a custom heart-shaped fridge magnet. 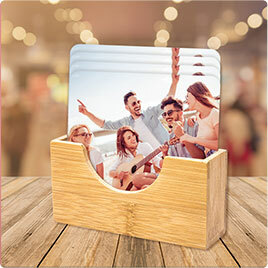 Spin your world with a new circle shaped photo magnet! Available in wood, metal and acrylic. Bigger photo for a magnet? Try our rectangle shaped magnet to fit your landscape photo! Choose the material – metal, wood, or acrylic. Then choose the shape. The sizes that match each shape will then pop up on the screen. If there is more than one size option, you may want to define which size you want. You can load images from your computer files, gallery, Facebook, or Instagram. File types accepted are PNG, JPG and BMP (up to 25 MB). 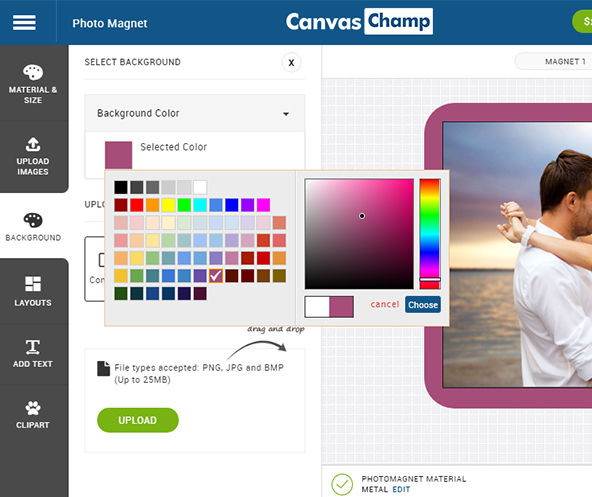 For background colour, click on Selected Color to customise a complementary colour for the border. Or upload a photo that has a border around the edges that would enhance your main picture. 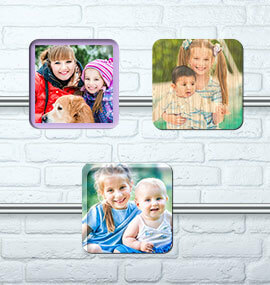 Along with a single-photo custom magnet, you can make collages with two, three, or four pictures. Under each number of photos, you will find various layouts. Magnify your personalised photo magnet with a quote or caption. Choose font type and size, alignment and style, plus unlimited colour options. Instead of an image, you may wish to choose from our many choices of clip art to go with a quote or personalised message. Just click on the picture you want. We know you have certain questions regarding our photo magnets. You can check some frequently asked questions as below or contact us for any assistance. What kind of surfaces can a photo magnet adhere to? Our photo magnets are printed with your detailed photo, text or image and have a powerful earth magnet set in the back for a stronghold. Magnets can mostly adhere to iron, nickel and cobalt, as well as blended-iron metals, such as steel. Most traditional surfaces for magnet use are refrigerators, lockers, file cabinets, metal shelves, and whiteboards. It is always indispensable to keep in mind, though, that magnets should be held away from tablets, laptops, smartphones, or anything with a magnetic range. Why are fridge magnets so synonymous with kitchen decor? Magnets were initially designed for space industry by an inventor named Sam Hardcastle. They were meant to be used for letters and numbers on large-scale tracking charts. As needs for it grew, new techniques for moulding them were developed, and Hardcastle began creating magnets for the souvenir industry. They very soon became a collector’s items. Today, magnets are everyday household items that allow for unique decorating opportunities on any unused space. 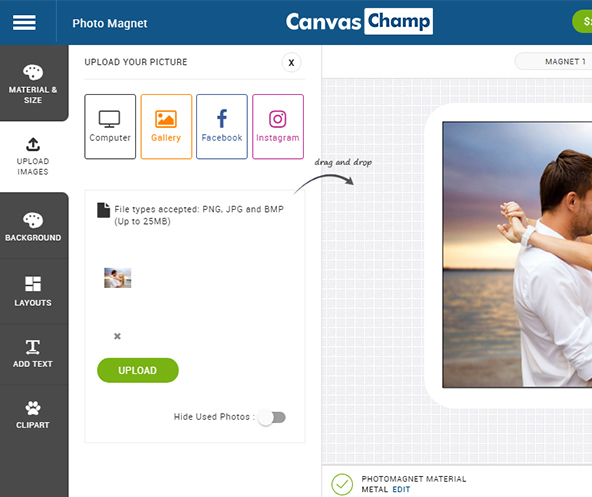 Instead of adorning your fridge with your photos prints, you can now have your desired images created into photo magnets, which frees up the space for shopping lists, reminders, take-out menus or kid’s fun artwork. Also, companies can create customised promotional magnets to keep their brand on top of the mind of their consumers or clients. What are the best ways to give photo magnets as gifts? 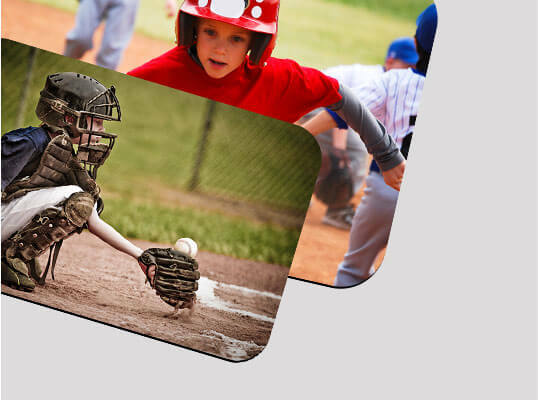 Because of their small, versatile size and comfortable fit in envelopes, photo magnets create an ideal canvas for a collection of fun situations. Baby baptism, graduation, and wedding announcements can last forever when they’re printed on photo magnets. 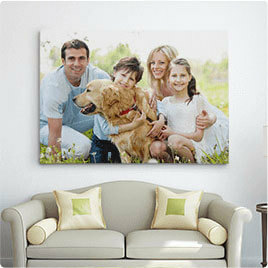 A particular photo together will remind Mom or Dad who’s the real favourite parent on Father’s or Mother’s Day. Family photos are good inclusive with a Diwali card or gift. Begin a yearly tradition with a personalised memento of your recent vacation. Make sure to keep one for yourself to create an interactive collage of all the exotic places you’ve visited. Funny images or sayings can liven up empty dorm rooms or first apartments where more permanent decorating options can be testing to negotiate. Photo magnets are also eminent in the office whiteboards or file cabinets and even as Secret Santa gifts for those difficult-to-please coworkers. Catchy phrases will always get laughs over from curious guests. Personalised photo gifts are a great excuse to set up a photo shoot. Get inventive and switch things up: different poses or props in burst mode can create a charming “photo booth” look that can lend inspiring character to space, while different angles of the same location can create unique panorama effect. How can I use customised magnets to promote my work? Personalised magnets also make fun and colourful advertising where your clients store their most important info – the fridge! Keep valuable contact info or a business card from slipping through the cracks by making it a functional magnet. Artists can create a bright and lasting impact by showing their work without the hassle of hyperlinks and shortcuts. Due to their small size, photo magnets can easily be given with flyers or given away at tradeshows and conventions. As they’re not printed on paper, magnets can survive harsh travel conditions like bad weather or leaks that might damage other promotional items. How do I create my custom photo magnets? 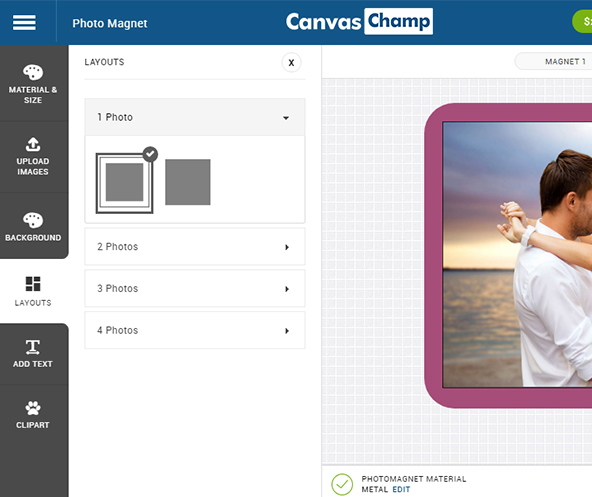 Designing and making your photo magnets is convenient with our online Canvas Champ photo magnet tool. 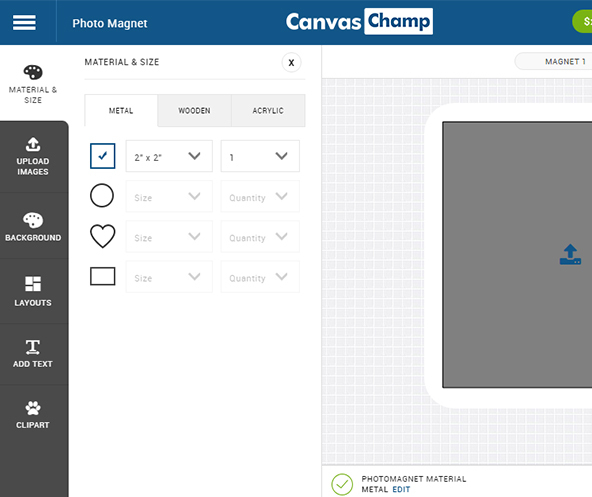 You upload the image of your choice, and our magnet tool will help you walk through different material, shape, layout, size and border options. Editing or resizing is simple to understand at this stage to guarantee your photo magnet turn out the way you envision it. You can add text during this step very quickly too. We also offer a fun collection of clip art images to add a funny or personal touch to a photo or text. It’s also important to determine before you finish your design whether you want multiples of the same image or different individual magnets. Primary magnets are rectangular, so images taken on your phone are already ready to go. But you can choose a square, heart, or round shape also. Our magnets are printed with Epson Ultra Chrome GS inks on Ribermark Endura Light 150 PVC-free paper and wrapped with a Mylar PET polyester film coating for long-lasting endurance. A powerful earth magnet coated with a black polypropylene back gives it a stronghold on heavy papers. 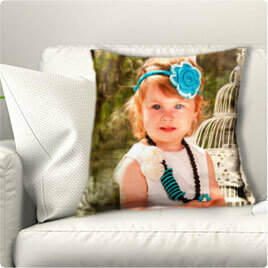 Custom throw pillows featuring your photos or artwork can add a colourful accent to your home. 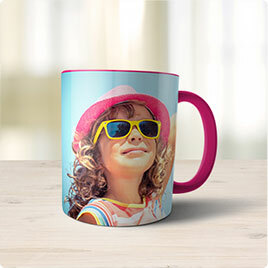 A mug customized with a favourite photo will easily become the favourite mug – whether it’s a ceramic mug, travel mug, beer mug, or magic mug. Transform treasured photos into museum-quality works of art, guaranteed to last a lifetime. A coaster, customized with a beautiful or humorous photo, will not only protect furniture but serve as a conversation starter.